Solanum insanum L. (Solanaceaeae) is the wild progenitor of common eggplant (S. melongena L.) and is naturally distributed in south and southeast Asia, Madagascar and Mauritius. 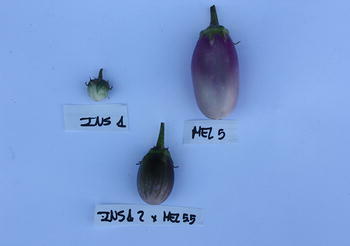 Despite interest in its potential for eggplant breeding it has not been studied extensively. Solanum insanum has been subjected to various taxonomic treatments, with several discussions and arguments on its delimitation as a species, due to its close similarities with the cultivated S. melongena and the wild species S. incanum L. from the Middle East and northern Africa. Solanum insanum has long been used in a variety of medicinal and culinary preparations across many different Asian ethnolinguistic groups. Limited studies carried out on its chemical composition and pharmacognostical properties coupled with ethnobotanic studies reveal that S. insanum has potential for eggplant improvement with respect to phytochemical properties of interest for human health. Further study of morphological and genetic diversity in S. insanum is essential to promote its utilization in eggplant breeding, in light of its potential to hybridize with cultivated eggplant successfully. Here we compile and review the taxonomy, phytogeography, ecology and habitat characteristics, cytology, ethnobotany, breeding and phytochemical analysis of S. insanum. A comprehensive botanical description and illustrations for S. insanum are provided. A detailed comparison of S. insanum and its closely allied species, S. melongena and S. incanum is also made. The potential of S. insanum for crop improvement and future research priorities are discussed. Solanum is the largest and most economically important genus in the family Solanaceae and comprises around 1400 species worldwide (Bohs 2005). Solanum subgenus Leptostemonum (also referred to as the Leptostemonum clade, sensu Bohs 2005), which is commonly known as the ‘spiny solanums’, contains more than 550 currently recognized species, many of which are native to the New World (Levin et al. 2006), where species diversity in the clade has long been thought to be highest (e.g., Nee 1999; Bohs 2005). Recent discoveries and new taxonomic circumscriptions have, however, revealed great spiny solanum diversity in the Old World. The Old World, including Africa, Asia and Australia, is home to more than 300 species, most of which are members of a monophyletic clade (Levin et al. 2006; Weese and Bohs 2007; Vorontsova and Knapp 2016; but see Aubriot et al. 2016 for exceptions). The spiny solanums from Africa have been extensively studied taxonomically (Bitter 1923; Jaeger 1985; Jaeger and Hepper 1986; Lester and Hasan 1990, 1991; Samuels 1996, 2010, 2012a, 2013b; Levin et al. 2006; Vorontsova et al. 2013), but the only comprehensive modern monograph is that of Vorontsova and Knapp (2016). Studies on the spiny solanums in Asia have been more limited (e.g., Deb 1989; Karihaloo and Rai 1995; Davidar et al. 2015; Mutegi et al. 2015), or limited to broad phylogenetic analyses with less discussion of species boundaries (Aubriot et al. 2016). The identity of the wild progenitor of the eggplant has been the subject of considerable taxonomic confusion. Solanum insanum was described in 1767 (Linneaus 1767). Since its first description, S. insanum has been treated in a wide variety of ways, from being ignored entirely, to being given infraspecific status, to being recognized at the species level under a variety of different names (Roxburgh 1832; Prain 1903; Duthie 1911; Gamble 1921; Bhaduri 1951; Deb 1979; Hepper and Jaeger 1985; Lester and Hasan 1990, 1991; Karihaloo and Rai 1995; Weese and Bohs 2010; Meyer et al. 2012; Knapp et al. 2013; Samuels 2010, 2012a, 2013a; Vorontsova et al. 2013; Aubriot et al. 2016; Vorontsova and Knapp 2016; see our current view of synonymy in taxonomic treatment below). Such differences in status and taxonomic treatment were largely due to its morphological similarity to and close affinity with cultivated eggplant (S. melongena) and other quite similar wild relatives (Knapp et al. 2013), and to the unfortunate similarity of the spelling of the specific epithet to that of S. incanum L. (Hepper and Jaeger 1985), another member of the eggplant clade (Aubriot et al. 2016; Vorontsova and Knapp 2016). Samuels (2016) has suggested that due to this spelling similarity and to the previously confused taxonomic usage, the name S. insanum should not be used; he, however, did not suggest suppression under the rules of the International Code of Nomenclature for algae, fungi and plants (McNeill et al. 2012). Others, however, consider the name not confusable (Knapp et al. 2013; see below), and recent clarification of both species limits (see below) and relationships means the name is now in current use (e.g., Cericola et al. 2013; Wu et al. 2013; Meyer et al. 2014; Aubriot et al. 2016). Until Knapp et al. (2013) re-visited species limits and identities in the eggplant clade, S. insanum was treated in two of the morphotypes of S. melongena, “S. melongena group E” and “S. melongena group F” (e.g., Lester and Hasan 1991; Daunay and Hazra 2012). For a review of the difficulties with the previous informal group classification see Knapp et al. (2013) and Syfert et al. (2016). Many early phylogenetic analyses using molecular data did not explicitly include S. insanum (Levin et al. 2006; Weese and Bohs 2007, 2010), but have included material that we would now identify as that species. Meyer et al. (2012) examined samples of S. insanum (as S. undatum Lam. or S. incanum) from India, Sri Lanka, China, Indonesia and Thailand for their analysis of phylogenetic relationships among Asian eggplants, and Vorontsova et al. (2013) also included samples from China, India and Indonesia for their phylogenetic analysis of African spiny solanums. More recent phylogenetic analyses using additional molecular markers and a broad sampling of Asian and African Solanum species (Aubriot et al. 2016) confirm previous hypotheses (Knapp et al. 2013; Meyer et al. 2015) that S. insanum is the wild progenitor of eggplant (S. melongena). These studies and unpublished work (X. Aubriot pers. comm.) do not support the proposed linear progression of relationships from Africa to Asia that has long been the paradigm for eggplant evolution (Lester and Hasan 1991; Weese and Bohs 2010; Samuels 2010, 2012b, 2013b). Support for the relationships amongst species of the eggplant clade (sensu Vorontsova et al. 2013) is weak, but new data from whole plastid sequences of additional species and involving denser sampling indicates the African species (including S. incanum) are, as a group, sister to S. insanum + S. melongena (X. Aubriot unpublished). Although data from molecular phylogeny together with evidence from chemical composition (Meyer et al. 2015) support S. insanum as closely related but distinct from S. melongena, future molecular phylogenetic analysis including an ample representation of S. insanum accessions is needed to provide in-depth information about relationships of populations across Asia, and on the geographical origins of S. melongena. Eggplant is thought to have several centres of domestication across Asia (India, China and Malesia), based on genetic differences (Meyer et al. 2012; Cericola et al. 2013) and non-overlapping medicinal uses (Meyer et al. 2014). Despite this relationship and its high potential for eggplant breeding, S. insanum has remained largely underutilized, despite being the progenitor and thus the only species included in the primary genepool of eggplant (Syfert et al. 2016). Crop wild relatives are likely to play a significant role in securing 21st century food security (Dempewolf et al. 2014). This is due to their potential uses in plant breeding to produce crop varieties which withstand adverse impacts of climate change, increasing scarcity of nutrients, water and other inputs, and new pest and diseases (Hopkins and Maxted 2010). Whereas genetic erosion of crops is generally due to replacement by new varieties or new crops, the wild relatives of crops are also vulnerable to habitat loss or habitat fragmentation (Hammer and Teklu 2008; Vaughan et al. 2013; Syfert et al. 2016). In this respect, identification of wild relatives with interest for crop improvement and conservation of genetic variation are key areas to address food security in the future. Even though S. insanum is the closest wild relative of eggplant and gives fertile hybrids with S. melongena (Bhaduri 1951; Rao 1956; Kashyap et al. 2003; Knapp et al. 2013), its characteristics, properties, genetic variation and potential for use in eggplant crop improvement have not to date been adequately explored. 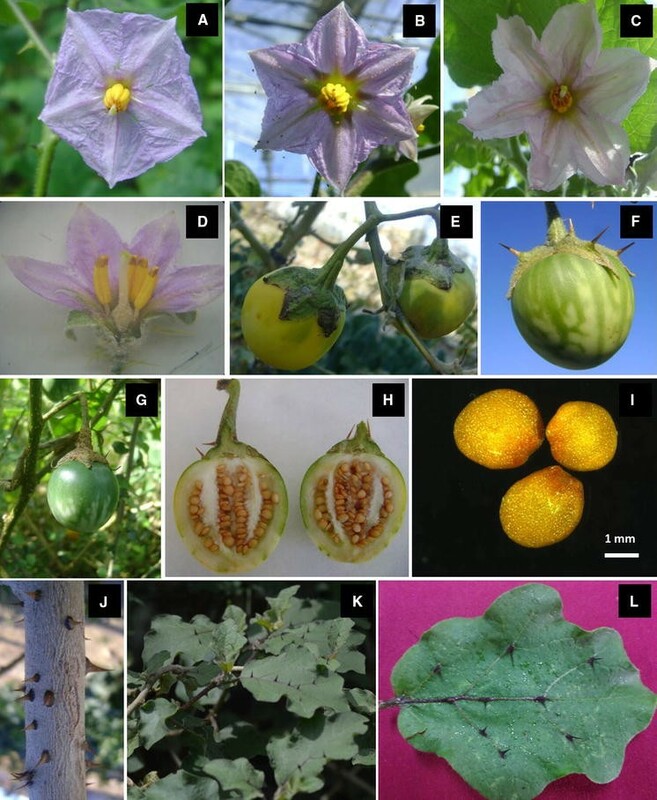 In this paper we compile and review available information on S. insanum taxonomy, phytogeography, ecology, cytology, uses, and phytochemical properties and discuss future perspectives for its use in eggplant improvement. The account is enriched by the findings of an ongoing project sponsored by the Global Crop Diversity Trust on “Utilization of crop wild relatives in eggplant pre-breeding for adaptation to climate change” in which S. insanum is one of the target species (Dempewolf et al. 2014). We believe that such information will be a useful information resource for taxonomists, plant breeders and conservation biologists who are working with S. insanum and will spark interest in this previously confused and largely neglected species. Our circumscription of S. insanum is based on herbarium specimens from 283 indivual collection events (ca. 400 specimens) from 22 herbaria (A, BH, BM, CAS, DS, E, F, G, G-DC, GH, HIFP, K, L, LE, MA, MO, NY, P, S, TAN, U, US; all herbarium acronyms follow Index herbariorum, http://sweetgum.nybg.org/science/ih/); all data for these specimens is available on the website Solanaceae Source and on the Natural History Museum Data Portal (http://dx.doi.org/10.5519/0001289). We complemented information from dried specimens with the evaluation of morphological traits of S. insanum plants growing in their native environment in Sri Lanka and in plants grown at the Universitat Politècnica de València (Spain). In addition, several field visits were made to assess the morphological traits of S. insanum in Sri Lanka and to record local uses. For the comparison of S. insanum with the closely related species S. incanum and S. melongena we uesd 44 morphological traits (Table 1) measured on living and preserved plants; characters recorded for S. insanum were scored from plants in different agro-climatic zones of Sri Lanka and plants cultivated in the Universitat Politècnica de València were also measured. Herbarium specimens were used for characters of S. incanum and S. melongena and we also included information from previous taxonomic publications where identities of individual plants were verifiable (Deb 1989; Lester and Hasan 1990; Karihaloo and Rai 1995; Knapp et al. 2013; Vorontsova and Knapp 2012, 2016). The distribution map was prepared using specimens with verified identity; those with latitude and longitude data on the labels were mapped directly. For those collections lacking geographical coordinates, we retrospectively georeferenced the collections using available locality data. The distribution map was constructed with the points in the centers of degree squares in a 1° square grid. We provide complete names and places of publication for synonyms of S. insanum; full nomenclatural details including citation and designation of types will be presented in a future monographic treatment of Asian spiny solanums (X. Aubriot and S. Knapp in preparation). Following Knapp (2013) we have used the square bracket convention for publications in which a species is described by one author in a publication edited or compiled by another. These citations are the traditional “in” attributions such as Dunal in DC. for those taxa described by Dunal in Candolle’s Prodromus Systematis Naturalis Regni Vegetabilis. This work is cited here as Prodr. [A.P. de Candolle] and the names are thus attributed only to Dunal. For “ex” attributions we cite only the publishing author, as suggested in the Code (McNeill et al. 2012). Standard forms of author names are according to IPNI (International Plant Names Index, http://www.ipni.org). In compiling the information on medicinal uses presented in Table 2 we have tried to identify reports that clearly refer to S. insanum and avoid reporting data for which a species identity was uncertain. Solanum insanum L., Mant. 1:46, 1767. Type. India. Gujarat: Surat, Collector unknown (lectotype, designated by Hepper and Jaeger 1985, pg. 389: LINN 248.9!). S. undatum Lam., Tabl. Encycl. 2: 22. 1794; S. canescens Blume, Bijdr. Fl. Ned. Ind. 13: 701. 1826; S. cumingii Dunal, Prodr. [A. P. de Candolle] 13(1): 363. 1852; S. melanocarpum Dunal, Prodr. [A. P. de Candolle] 13(1): 355 (1852), nom. superfl. illeg. ; S. album Lour. var. gaudichaudii Dunal, Prodr. [A. P. de Candolle] 13(1): 361. 1852; S. cyanocarphium Blume var. obtusangulum Dunal, Prodr. [A. P. de Candolle] 13(1): 362. 1852; S. indicum Nees var. pubescens Dunal, Prodr. [A. P. de Candolle] 13(1): 310. 1852; S. schoenbrunnense Dunal, Prodr. [A. P. de Candolle] 13(1): 365. 1852; S. trongum Poir. var. tongdongense Dunal, Prodr. [A. P. de Candolle] 13(1): 361. 1852; S. undatum Lam. var. aurantiacum Dunal, Prodr. [A. P. de Candolle] 13(1): 359. 1852; S. undatum Lam. var. violaceum Dunal, Prodr. [A. P. de Candolle] 13(1): 359. 1852; S. melongena L. var. insanum (L.) Prain, Bengal Pl. 746 (1903). Erect or prostrate branched shrub, 0.5–1.5 m, prickly. Young stems terete, occasionally purplish, moderately stellate-pubescent to glabrescent with minute simple hairs, prickly, the stellate trichomes porrect, translucent, stalked, the stalks to 0.2 mm long, the rays 6–12, 0.2–0.4 mm long, the midpoints ca. same length as the rays or to 1 mm, the prickles 3–8 mm long, 0.5–5 mm wide at base, straight, flattened, yellow–orange or purple, glabrous, spaced 2–10 mm apart; bark of older stems glabrescent, gray to brown. Sympodial units difoliate, the leaves not geminate. Leaves simple, the blades 2.5–12 cm long, 1.3–8 cm wide, ca. 1.5× longer than wide, ovate, chartaceous, with 2–20 prickles on both surfaces, the prickles green or purple; adaxial and abaxial surfaces moderately stellate-pubescent with porrect, sessile or stalked trichomes, the stalks to 0.2, the rays 5–8, 0.3–1 mm long, the midpoints ca. same length as the rays; major veins 3–5 pairs, sometimes purplish near the petiole, the finer venation usually visible abaxially but not adaxially; base truncate, sometimes obtuse; margins lobed, the lobes 2–3 on each side, 0.5–1.2 cm long, broadly deltate, apically rounded, the sinuses extending 1/4–1/3 of the distance to the midvein; apex rounded to acute; petiole 0.7–3 cm long, 1/4–1/3 of the leaf blade length, 2–3 mmm in diameter, moderately stellate-pubescent to glabrescent, with 0–5 prickles. Inflorescences apparently terminal or lateral, 2.5–3.5 cm long, unbranched, with 1–3 flowers, 1 flower open at any one time; axes moderately stellate-pubescent to glabrescent, unarmed; peduncle 0–13 mm long; pedicels 0.8–1 cm long, erect, articulated at the base, moderately stellate-pubescent to glabrescent, unarmed; pedicel scars spaced 1–2 mm apart. Flowers 5(-6)-merous, heterostylous and the plants andromonoecious, with the lowermost flower long-styled and hermaphrodite, the distal flowers short-styled and staminate. Calyx 0.5–1 cm long, moderately stellate–pubescent, with 0–15 prickles, the lobes 4–6 mm long, deltate, apically acute. Corolla 1.6–2.6 cm in diameter, mauve, almost rotate, lobed for ca. 1/4 of the way to the base, the lobes 7–10 mm long, 10–15 mm wide, broadly deltate, spreading, sparsely stellate-pubescent abaxially, the trichomes porrect, sessile or stalked, the stalks to 0.2 mm, the rays 4–8, 0.2–0.7 mm long, the midpoints ca. same length as the rays. Stamens equal, with the filament tube ca. 1.5 mm long, the free portion of the filaments ca. 1 mm long; anthers 4.5–6 mm long, connivent, tapering, poricidal at the tips. Ovary stellate-pubescent in the upper 1/4; style 0.5–0.7 cm long in long-styled flowers (0.2–0.3 cm long in short-styled flowers), broad and straight, moderately stellate-pubescent in the lower 1/2. Fruit a spherical berry, 1–2 per infructescence, 1.5–3 cm in diameter, the pericarp smooth, dark green with pale green and cream markings when young, yellow at maturity, glabrous; fruiting pedicels 1.5–2.2 cm long, 1.5–3 mm in diameter at base, woody, pendulous, with 0–5 prickles; fruiting calyx lobes expanding to 9–15 mm long, 1/4–1/3 the length of the mature fruit, reflexed, with 2–30 prickles. Seeds ca. 50–150 per berry, 2.4–3 mm long, 1.8–2.2 mm wide, flattened-reniform, orange–brown, the surfaces minutely pitted, the testal cells with straight lateral walls. Chromosome number: n = 12 (Meyer et al. 2012). (Figure 3) Solanum insanum occurs throughout south and southeast Asia, from eastern Pakistan extending southwestwards to the Indian Ocean islands of Madagascar and Mauritius (where it may have been taken by people) and eastwards to the Philippines. Bean (2012 onwards) reports S. insanum as naturalized in Queensland; this is certainly an introduction. Solanum insanum has been cited as occurring in Afghanistan (https://training.ars-grin.gov/gringlobal/taxonomydetail.aspx?id=462492), but no specimens or references are cited. We have seen no herbarium specimens of S. insanum from Afghanistan, but the related species S. incanum is known from Iran, Afghanistan and western Pakistan in desert areas. Solanum insanum is an annual or perennial weed usually growing in open fields and disturbed habitats around villages and other human-impacted areas. In Sri Lanka, we have observed it cultivated in home gardens in all climatic zones as well as in shifting cultivation (slash and burn cultivation) in the drier parts of the island (0–600 m) where it grows on a wide range of geographical, climatic and soil conditions and thrives well even in infertile soils. This suggests that material of S. insanum might be useful for eggplant breeding for adaptation to drought and other abiotic environmental stresses. Solanum insanum is very variable morphologically both across its range and within populations (Knapp et al. 2013). Hepper (1987) treated S. insanum as a variety of S. melongena in his treatment of Solanaceae in the Flora of Ceylon where he indicated that “many forms of this variable species are apparent, even in a single wild population”. In fact, many intermediate forms between S. melongena and S. insanum are present in Southeast Asia, indicating that gene flow exists between both species (Davidar et al. 2015; Mutegi et al. 2015). Considerable variation has also been described both between and within populations in central and southern India (Deb 1979; Karihaloo and Rai 1995; Davidar et al. 2015; Mutegi et al. 2015). All members of the eggplant clade are morphologically very similar (Knapp et al. 2013). Deb (1989) used prominent morphological traits to investigate the species boundaries of S. insanum, S. melongena and S. incanum, and Lester and Hasan (1990) compared S. insanum and S. incanum; both these authors distinguished the taxa as different, although later authors (Lester and Hasan 1991; Daunay and Hazra 2012) used a series of informal group names under the species names “S. incanum” and “S. melongena” to encompass the variation and partial overlap in character states amongst these plants. As shown using molecular tools, S. insanum, S. melongena, and S. incanum are indeed closely related, but distinct (Meyer et al. 2012, 2015; Knapp et al. 2013; Mutegi et al. 2015; Aubriot et al. 2016). Solanum insanum is morphologically similar to the mostly African species S. incanum (distributed from northern Africa to Pakistan, see Vorontsova and Knapp 2016), but can be distinguished from it in its sparser pubescence, less robust and usually straighter prickles, larger flowers, and distribution in Asia (see Table 1; Vorontsova and Knapp 2016), although poorly prepared specimens from Pakistan can be difficult to identify. Solanum insanum has erect and prostrate forms throughout its range, while S. incanum is always an erect shrublet or shrub. The two species are possibly sympatric in Pakistan (although we have seen no evidence of this), but S. incanum occurs in drier habitats and further to the west than S. insanum. The distribution of S. incanum is from western Pakistan, Afghanistan and Iran across the Middle East and northern Africa. Citations of S. insanum from these areas are almost certainly references to S. incanum (or to the cultivated eggplant itself). Confusion over the distributional limits of these taxa comes in part from the treatment in Flora Iranica (covering western Pakistan, Afghanistan and Iran; Schönbeck-Temesy 1972) where the correct name, S. incanum, was used, but the distribution of the species was said to include what we know recognize as S. insanum. All specimens cited by Schönbeck-Temesy (1972) are S. incanum. As a cultivated plant, S. melongena shows morphological differences to S. insanum associated with domestication and subsequent evolution with human populations. These include fewer prickles on all plant parts, larger, often fasciated flowers with supernumerary parts, larger fruits, and spongy fruit mesocarp (Knapp et al. 2013; see also Table 1). Some landraces, however, can approach S. insanum in fruit size or stem prickliness. Also, some modern F1 hybrids have been created by seed companies in southeastern Asia that mimic fruits of S. insanum in fruit size, shape and colour, although they generally have no prickles on the calyx. Mutegi et al. (2015) reported outcrossing rate among the wild/weedy populations of S. insanum ranged from 5–33%, indicating a variable mixed-mating system. In addition Davidar et al. (2015) suggested that the exserted stigmas of S. insanum are likely to promote outcrossing and the most effective pollinators appeared to be bees, potentially increasing the diversity of S. insanum in wild populations. Because S. melongena and S. insanum are interfertile, and intermediate individuals can be observed, Knapp et al. (2013) suggested a set of criteria useful for ascribing these intermediates to an individual species category. Assignment of a species name to an accession would be based on the number of characters shared (see Table 3 in Knapp et al. 2013). Samuels (2013a) disagreed with the distinction of S. insanum and S. melongena, but offered no new evidence beyond that published previously (Samuels 2012a) using morphological analysis of a limited number of accessions. The existence of intermediate hybrids between S. insanum and S. melongena is the basis for the wide variety of taxonomic treatments of these taxa in the past, through strict application of the Biological Species Concept (Mayr 1942). The eggplant clade is relatively young, with a median minimum age estimate of 3.4 (2.7–4.1) mya (Särkinen et al. 2013), which suggests considerable gene flow, even amongst wild species, will be recoverable using more in-depth molecular methods. It is clear in both plants and animals that ongoing hybridization between closely related species is common in nature (Mallet 2005; Rieseberg 2009). Recent phylogenomic studies in both plants (e.g., Blanca et al. 2012; Bock et al. 2013; Causse et al. 2013; Pease et al. 2016; Novikova et al. 2016) and animals (e.g., Fontaine et al. 2015; Martin et al. 2013; Kryvokhyzha 2014), suggest that speciation with substantial gene flow is more common than previously thought and that the degree of introgression can be much higher than expected, especially in rapid, recent radiations (e.g., Pease et al. 2016). We can expect this to be even more true in domesticates that are not geographically separated from their wild progenitors. Despite evidence of introgression that sometimes may cause difficulties in assigning a species name to individual plants, we consider it important to recognize domesticated species such as S. melongena as distinct from their wild progenitors (here S. insanum) because domesticated plants are experiencing a completely different selection regime in commensal association with human populations than are their wild relatives. In their discussion on the typification of S. insanum, Hepper and Jaeger (1985) clearly explain that Linnaeus described S. insanum as distinct from his earlier S. melongena by indicating its prickly stems (and calyx) and thus, indicated that he considered S. insanum a new species and not a replacement name for S. melongena (as S. sanctum was for S. incanum in the same publication, Linnaeus 1762). Some authors have suggested that S. insanum was a misprint for S. incanum (see Hepper and Jaeger 1985; Samuels 2016); it is unfortunate the two names are so similar but they are not considered confusable (R. Brummitt, pers. comm.). Hybrids between S. insanum and S. melongena are fully fertile (Swaminathan 1949; Mittal 1950; Bhaduri 1951; Rao 1956; Kashyap et al. 2003), which is not surprising given that both species are diploid (2n = 24 for S. melongena). The direct cytological assessment of two accessions of S. insanum with contrasting phenotypes was conducted by Rai (1959). He evaluated one accession with big leaves and few thorns, which was diploid and had 12 chromosomes, and another one with small leaves and dense thorns, which had a small ‘fragment’ in addition to normal diploid complement. Kirti and Rao (1982) also reported 12 chromosomes in S. insanum (2n = 24) and studied chromosome associations and frequencies of associated chromosome arms in S. insanum and its hybrid with S. integrifolium Poir. (=S. aethiopicum L., the Scarlet eggplant, an African species cultivated for its leaves and fruits that is not a member of the Eggplant clade s.s.; see Vorontsova et al. 2013). Eggplant (S. melongena) has long been used in a variety of medicinal and culinary preparations across many different Asian ethnolinguistic groups (Meyer et al. 2014). Because of the close similarity and taxonomic confusions between S. insanum and S. melongena (Knapp et al. 2013), it is often difficult to separate the information on medicinal uses and food value of S. insanum from S. melongena in the literature. For example, Jayaweera (1982) has given the medicinal properties of Solanum surattense Burm. f. (=S. virginianum L.), but both his description and botanical illustration are of the local Sri Lankan form of S. insanum. Our observations in local communities in Sri Lanka indicate that people have a clear knowledge of the differences between S. insanum, known as “Ela batu”, and S. melongena known as “Batu”. Knapp et al. (2013) reported that in southern China S. insanum is considered distinct from the cultivated S. melongena by local people. Meyer et al. (2014) compared medicinal attributes of S. melongena and S. insanum in China, India and the Philippines. In all three areas the species were clearly distinguished, but had similar medicinal uses. In Asia, S. insanum is consumed as a vegetable, mainly as a component of curries, but Meyer et al. (2014) found its consumption was always associated with medicinal properties. In some areas, S. insanum use differs markedly from use of S. melongena, further supporting their distinction. Meyer et al. (2014) found that in the Philippines it is recommended to avoid S. insanum consumption when pregnant; however, domesticated eggplants were associated with improved foetal development, and S. melongena root was used to promote uterine stabilization after miscarriage. In Sri Lanka, people recommend consumption of S. insanum fruits (as a curry) when suffering from colds; conversely S. melongena is not recommended for treatment of the common cold. Solanum insanum is important medicinally across Asia (Brown 1920; Jayaweera 1982; Sivarajan and Balachandran 1994; Elias et al. 2010; Meyer et al. 2014; Hul and Dy Phon 2014, as S. incanum); some medicinal uses of S. insanum in selected Asian countries are summarized in Table 2. Further collection and documentation of such information and knowledge from different Asian ethnolinguistic groups will support the advancement of future pharmacological studies related to S. insanum, as well as helping to promote its use for the breeding of eggplants with improved bioactive properties beneficial for human health (Plazas et al. 2013). The pharmacognostical and phytochemical properties of cultivated eggplants are well known (Sulaiman and Shree 2012; Wu et al. 2013; Komlaga et al. 2014) but there is much less information from S. insanum. Elias et al. (2010) assessed extracts of root, fruits and leaves of S. insanum (as S. melongena var. insanum) used in Ayurvedic preparations and showed that the methanolic extract of root contained the highest number of phytoconstituents such as flavonoids, coumarins, alkaloids, tannins, anthroquinines, phenols, resins, glycosides/reducing sugar, proteins and carbohydrates. Bhakyaraj (2010) suggested that the production of solasodine from field grown plants and in vitro raised callus and hairy roots of S. insanum is an efficient way to generate an alternative source of supply of solasodine, a glycoalkaloid used as a precursor in the production of complex steroidal compounds such as contraceptive pills (Roddick 1986). Sulaiman and Shree (2012) compared the pharmacognostical and phytochemical properties of root of S. insanum with four other Solanum species; S. insanum had the highest total flavonoid content of the species they used. The fruit metabolites of S. insanum were studied by Wu et al. (2013) as part of the development of a Solanum-specific metabolic database using LC–TOF-MS. They reported 34 metabolites from the phenylpropanoid, flavonoid/anthocyanin, complex alkaloids and shikimate and aromatic acids pathways in S. insanum. Of these, 31 were present in both S. insanum and S. melongena, but three (the flavonoid glucosides kaempferol-3-O-rutinoside-7-O-glucoside, naringenin-7-O-glucoside, and the flavonone eriodictyol) were present in S. insanum but absent from S. melongena. Meyer et al. (2015) also found that S. insanum had higher total levels of phenolic metabolites than did S. melongena, and that for eight of these, including the most abundant phenolic compound 5-O-(E)-caffeoylquinic acid, these differences were significant. Wu et al. (2013) suggested that the differences between S. insanum and S. melongena were related to domestication and subsequent human selection for chemical properties. Some of the compounds present in S. insanum, like 5-O-(E)-caffeoylquinic acid, have bioactive properties of interest for human health (Plazas et al. 2013). However, further studies on pharmacognostical and phytochemical properties of S. insanum are needed to assess its potential role in the improvement of bioactive constituents of eggplant. The study of the diversity of S. insanum is essential to maximize and promote its use in eggplant breeding, especially in Asia where morphological and genetic diversity is likely to be greatest (Hepper 1987; Karihaloo et al. 1995; Karihaloo and Rai 1995; Mutegi et al. 2015). Among the Asian countries, the range of variation in S. insanum has only been reported on in detail from India (Karihaloo and Rai 1995). Karihaloo et al. (1995) reported a greater DNA polymorphism in weedy S. insanum rather than in advanced cultivar of eggplants. Recently, Mutegi et al. (2015) carried out the first comprehensive study on genetic diversity and population structure of S. insanum in southern India. The results reveal that three clusters are formed, largely according to their geographic origin. They reported outcrossing rate among the wild/weedy populations ranged from 5 to 33%, indicating a variable mix-mating system. In addition Davidar et al. (2015), found evidence of natural hybridization between S. melongena and S. insanum in southern India and reported that the exserted stigmas of S. insanum are likely to promote outcrossing and the most effective pollinators appeared to be bees, potentially increasing the diversity of S. insanum. This broad diversity has great potential for exploitation to broaden the genetic diversity of eggplant, which is low, at least in the advanced cultivars (Muñoz-Falcón et al. 2009). Solanum insanum and S. melongena are fully interfertile and hybridization results in large number of seeds per fruit with good germination (Davidar et al. 2015; Plazas et al. 2016). Interspecific hybrids between S. melongena and S. insanum are intermediate to both parents in fruit size and morphology (Fig. 4), which is in contrast to interspecific hybrids with other wild species, where fruits from hybrids are usually much more similar to the wild relative parent (Kaushik et al. 2016). This seems to indicate that there will be a rapid recovery of fruit size and typical characteristics of the fruit of S. melongena in backcross breeding programmes using S. insanum as donor parental. The development of a set of lines of S. melongena containing introgressions of S. insanum like those used extensively in the improvement of tomatoes (e.g., Eshed and Zamir 1994; Caruso et al. 2016) could be of great interest to breeders. 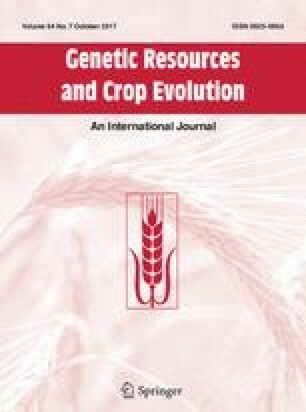 The application of modern molecular marker tools as well as sequencing of the transcriptome and/or genome of S. insanum from populations across its wide geographical range and extensive morphological diversity will also provide relevant information for future utilization of S. insanum in eggplant breeding. Collection and assessment of wild populations of S. insanum is important for both ex situ and in situ conservation. Mutegi et al. (2015) found a high degree of genetic diversity in populations of S. insanum in southern India and suggested that the major genetic clusters they detected should be used as a starting point for intraspecific germplasm conservation. Hepper (1987) also reported highly polymorphic populations from Sri Lanka, indicating that it is important to sample populations across the distribution of S. insanum in Asia and assess their morphological and genetic diversity for the utilization and conservation of this unique genetic pool for the future. The ex situ conservation of S. insanum is feasible as the seeds are orthodox and can be stored for many years under conditions of low seed moisture and low temperature. In parallel, it is important to investigate the tolerance or resistance of S. insanum to resist various pest and diseases and for adaptation to different environmental conditions. In addition to use of S. insanum as a genetic resource for developing new eggplant varieties, improvement of the eggplant crop can be achieved by using rootstocks of this species for grafting (Gisbert et al. 2011). Irregular seed germination and dormancy is often a problem in grafting, however, and for commercial production it is necessary to have a good synchronization between the cultivated species scion and the wild species rootstock; for optimal use of wild species rootstock this remains to be solved. Subasinghe et al. (2003) reported that seed treatment with 20% HNO3 and 20 µmol gibberellic acid enhances seed germination of S. insanum and recommended soft-wood cutting for vegetative propagation. We have found that soaking seeds for one day and imbibition for another day in a 500 ppm solution of gibberellic acid stimulates a rapid and regular germination in S. insanum. Very little biotechnological research has been done with S. insanum. Nishio et al. (1987) were able to regenerate S. insanum plants efficiently using the protoplast technique. Samuels (2012b) discussed the potential of wild, weedy and cultivated varieties of eggplant (in which he included S. insanum) to improve genetically engineered Bt brinjal, but later suggested that gene flow from Bt brinjal was a significant threat (Samuels 2013c); he presented no original work using this or any other species, but cited lack of knowledge about the biology of eggplant relatives. Screening of S. insanum for bioactive compounds and the evaluation of biological properties may result in the discovery of functional applications for S. insanum in human health, as has been found with cultivated eggplant (Plazas et al. 2013). The compilation of indigenous knowledge associated with S. insanum will also help in its future utilization. In summary, the knowledge on, taxonomy, morphological and genetic diversity, and properties of S. insanum is incomplete, in particular in southeast Asia, even though it is a prime need in order to understand its potential for crop improvement. We hope that this review article will provide baseline information on S. insanum and its potential for crop improvement for plant breeders, taxonomists and conservation biologists who are engaging in studies on eggplant and their wild relatives. We thank Mr. Indika Peabotuwage, Faculty of Science, University of Peradeniya, Sri Lanka for the botanical illustration of S. insanum; Zair Ficinski for preparing the distribution map; and the curators of the herbaria we consulted for use of the specimens in their care. This work was undertaken as part of the initiative “Adapting Agriculture to Climate Change: Collecting, Protecting and Preparing Crop Wild Relatives” (http://www.cwrdiversity.org/) that is supported by the Government of Norway, managed by the Global Crop Diversity Trust with the Millennium Seed Bank of the Royal Botanic Gardens Kew, and implemented in partnership with national and international gene banks and plant breeding institutes around the world; work constructing the database underpinning Solanaceae Source was funded by the National Science Foundation (DEB-0316614 “PBI Solanum: a worldwide treatment” to SK); herbarium visits for SK and XA were funded from the SYNTHESYS Project (http://www.synthesys.info/) which is financed by European Community Research Infrastructure Action under the FP6 and FP7 “Structuring the European Research Area” Programmes. The authors declare that they have no other conflicts of interest.